1. Roger CLIFFORD, son of Robert, Lord CLIFFORD (1274-1314) and Maud de Clare ( - ), had the title '2nd Lord Clifford'. Roger rebelled against the King and paid for it with his life. 2. Robert, Lord CLIFFORD, son of Sir Roger CLIFFORD and Isabel de VIPONT, was born in 1274. He had the title '1st Lord Clifford'. He married Maud de Clare on 13 November 1295. 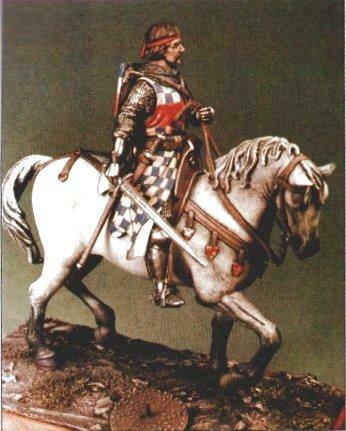 He died on 24 June 1314 in Battle of Bannockburn. Robert de Clifford, 1st Baron de Clifford, also 1st Lord of Skipton (c. 1274¨C1314), was an English soldier who became first Lord Warden of the Marches, defending the English border with Scotland. He was born in Castle Clifford, Herefordshire and married there in 1295 Maud de Clare by whom he had three children. A son of Roger de Clifford (d. 1282), he inherited the estates of his grandfather, Roger de Clifford, in 1286. He then obtained through his mother part of the extensive land of the Viponts. He was summoned to parliament as a baron in 1299. In 1308 he acquired on the death of his aunt the remainder of the Vipont lands and thus became one of the most powerful barons of his age. 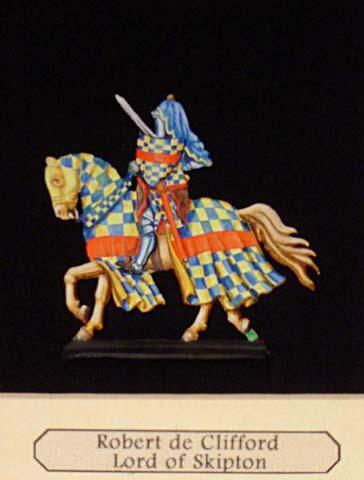 During the reigns of Edward I and Edward II, Clifford was a prominent soldier from an early age. In 1296 he was sent with Henry Percy to quell the Scots who asked for terms at Irvine. He was appointed Governor of Carlisle. During the reign of the first king, he was styled Warden of the Marches and then, during the reign of the second, Lord Warden of the Marches, being the first holder of this office. In 1298 he fought with Edward I at the Battle of Falkirk in which William Wallace was defeated,for which he was rewarded with Gocernorship of Nottingham castle. He won great renown at the siege of Caerlaverock Castle in 1300. After the death of Edward I in 1307 and along with the Earls of Lincoln, Warwick and Pembroke he was appointed counsellor to Edward II and in the same year the new king appointed him as the Justiciar of England South of the Trent. In 1310 Edward also granted him Skipton Castle and the Honour of Skipton in Craven. He took part in 1312 with the Earl of Lancaster in the movement against Edward's favourite, Piers Gaveston, besieging him at Scarborough Castle. Clifford was killed on 24 June 1314 fighting at the Battle of Bannockburn. and was buried at Shap Abbey in Westmoreland. Robert was present at the death of Edward I in 1307 and along with the Earls of Lincoln, Warwick and Pembroke he was appointed counsellor to Edward II and in the same year the new King appointed him as the Justiciar of England South of the Trent. In 1310 Edward II granted him Skipton Castle and the Honour of Skipton in Craven. Robert Clifford had promised the dying Edward I that he would not let Piers Gaveston lead the new King astray so in May 1312, along with the Earl of Lancaster, he besieged Scarborough Castle where Gaveston had taken refuge. Gaveston soon surrendered and was executed without trial. Robert was appointed Governor of Norham Castle in 1314 as he mustered men for what was to become know as the battle of Bannockburn. King Edward's army was defeated on 24th Jun 1314 and among the English dead was Robert 1st Lord Clifford. See The House of Clifford Ch.12. On page 55 it mentions a poem that describes Robert's grandmother as Isabel De Bigod, Dau. of Hugh le Bigod, Earl of Norfolk; yet on page 51 it describes his ancestors which does not include Isabel De Bigod. Inherited the his mother's half of the Vipont estates in 1291 and following the Died of his aunt Idonea in 1308 he was able to reunite the two halves of the Vipont estates under the Clifford name. Robert was very active against the Scots from a very early age and in 1296/7 along with Henry Percy he was ordered to invade Scotland. Scots, who were camped at Irvine, quickly asked for terms rather than fight the combined cavalries of Percy and Clifford. Robert was appointed Governor of Carlisle, captain and guardian of the Scottish marches and of the county of Cumberland. Lord Clifford took part in the battle of Falkirk that saw King Edward I's decisive victory over William Wallace and was rewarded with the governorship of Nottingham Castle. Robert was present at the death of Edward I in 1307 and along with the Earls of Lincoln, Warwick and Pembroke he was appointed counsellor to Edward II and in the same year the new King appointed him as the Justiciar of England South of the Trent. In 1310 Edward II granted him Skipton Castle and the Honour of Skipton in Craven. Robert Clifford had promised the dying Edward I that he would not let Piers Gaveston lead the new King astray so in May 1312, along with the Earl of Lancaster, he besieged Scarborough Castle where Gaveston had taken refuge. Gaveston soon surrendered and was executed without trial. Robert was appointed Governor of Norham Castle in 1314 as he mustered men for what was to become know as the battle of Bannockburn. King Edward's army was defeated on 24th Jun 1314 and among the English dead was Robert 1st Lord Clifford. By his wife, Maud De Clare, Robert left three children, Roger, Robert and Idoine. 3. Maud de Clare (also known as Maud de CLARE) has few details recorded about her. She was born into a high noble family, the Clares, Earls of Gloucester. Idonia de CLIFFORD (c. 1300-1365). Idonia was born circa 1300. She died on 24 August 1365. Robert CLIFFORD (1305-1344). Robert was born on 5 May 1305. He had the title '3rd Lord Clifford'. He married Isabel BERKELEY in June 1328 in Berkeley Castle, Gloucestershire. He died on 20 May 1344. 4. Sir Roger CLIFFORD, son of Sir Roger CLIFFORD and Loretto, was born in 1248. He died on 6 November 1282 in Menai Straits, Anglesey. He married Isabel de VIPONT.